It makes perfect sense in Windows 8 to use your Microsoft account to keep things up-to-date and synchronized. Consider all those “Live Tiles”, for instance, which would otherwise suffer an untimely death due to a lack of Internet sustenance. On a single-user system, however, it is plain drudgery to log in every time you want to use your computer. Here’s a simple fix for yet another nuisance whose sole cause are the crooks “out there”. This is a fine solution for those of you who are the only ones using your computer. For computers that have multiple users, this is ill-advised. Also consider what might happen if a thief were to gain access to your system. This situation would negate any benefits you may garner from the following tips. If you feel compelled to bypass the log-on security services offered by Windows, and you think you may be robbed in the near future, it might be a smart thing to encrypt your entire hard drive first. That way, if the unthinkable happens, you’ll be covered. The bad guys will still have your computer, but they won’t have your data. Give it some thought. 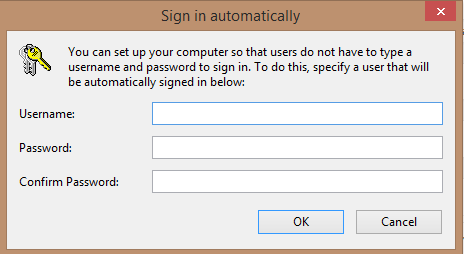 There is a check box with the long-winded “Users must enter a user name and password to use this computer.” label. It is so long, in fact, they even felt compelled to put a period at the end of it. Type those details into the boxes provided and then click OK.
Re-start your computer to be sure everything is in working order. If not, you missed a step like clicking the OK button at some point. I accomplish these simple-minded errors on a daily basis, so don’t feel alone. A Reminder: It is not advised for computers that are used by more than one person, are on public networks such as your favorite Internet Coffee Shop, or laptops that may be easily lost, forgotten or stolen. Prev:How do you handle crapware? thinks for the tid bit. It helps a lot when you can just turn on and go to work. Notes: It’s a bad idea for anyone, particularly people who are not totally savvy enough to understand how to properly set up their computer/home internet security (- i.e. about 99.99999% of all internet users). In short: DON’T do this – to help make the internet far safer place for yourself and everyone else. It’s like leaving your door unlocked so you don’t have to bother carrying keys. YES IT IS THAT BAD IF NOT WORSE. And as an “expert” promoting this tip to the masses, please? Maybe I’m reading a bit much into your comment, but it comes across a bit brash. You (hopefully) noticed the caveats mentioned at the beginning and toward the end of the article, and while not all inclusive I’m sure you will agree that they do indicate that bypassing the login screen can have some very bad consequences. Remember you catch more flies with honey – and maybe spur productive conversation! While I personally believe a login password is a good idea, there are valid situations where even I bypass the login screen – I’m sure I’m not alone. While skipping the login screen does involve added risks I can say with 100% certainty that a computer is more likely to be compromised by the direct actions of a user than any remote exploit not initiated by the user (removing NAT completely from the equation, of course). I follow the computer security field pretty closely (as I’m sure Richard does also) and I haven’t heard the term DOS bot. Is this something new that I’m unaware of? Can you point me/us to more information? I’m sure everyone would agree that the only true method to remain completely safe is to pull the plug on the computer. Everything has a risk and it is up to each individual to assess the risk level they are willing to accept.